Last week, we began our study of sentence patterns. Remember, if you recognize the pattern of a sentence’s core parts, the grammar of the sentence (or its word arrangement) will make more sense. Last time, we discussed Pattern 1 and Pattern 2. Today, let’s start our study with a new Pattern 2 Sentence: Jackson throws some bread. Remember, transitive verbs (V-t) transfer action to an object. Now, let’s remake this sentence into a Pattern 3. We will simply add an indirect object (IO). The chickens get the bread Jackson is throwing. That makes the chickens the indirect object. Here is the pattern: SN V-t IO DO. Step 1 – Substitute the subject noun, verb, and direct object in your own sentence. Step 2 – Add an indirect object that can receive your direct object…and still make sense! Next time, we’ll learn about Pattern 4! Learning English grammar can be tough, but, as the saying goes, a picture paints a thousand words. So, I am taking the high road on this series and making it visual—thereby sparing well over 980 words…and your sanity! 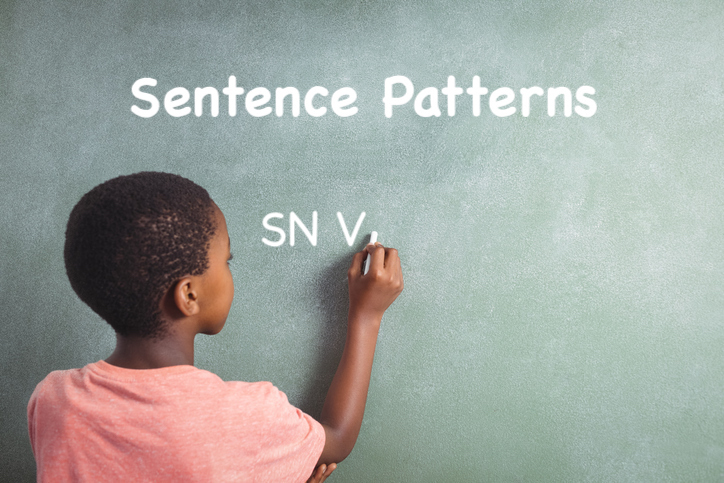 This sentence follows the SN V pattern. In Shurley English, we call this Pattern 1. We know who the sentence is about and what he is doing. Now, watch as the pattern changes to Pattern 2. Pattern 2 sentences have a SN V-t DO pattern (DO stands for direct object). You still have the subject noun and a verb, but the verb is transitive this time. Transitive verbs (V-t) transfer action to an object. 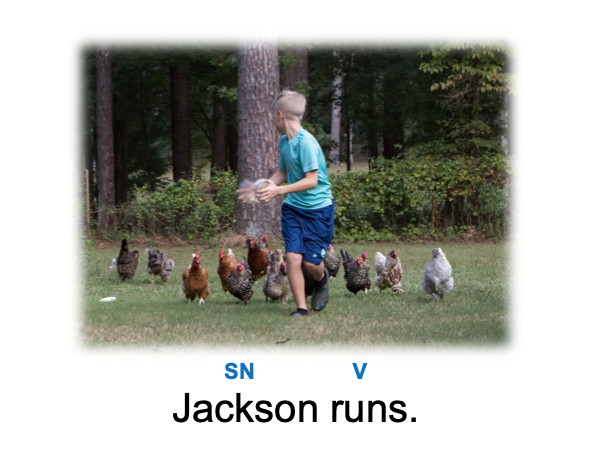 In this case, Jackson has become the object that gets chased…by the chickens. (Run, Jackson, run!) Jackson is now the direct object that is getting chased by the chickens. Jackson receives the action of the verb, chase.